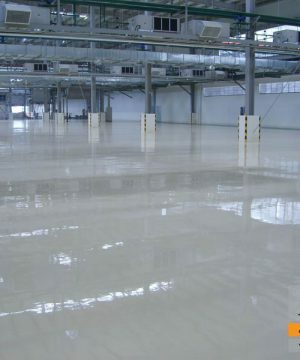 Vinyl ester resin-based linings are known for their solvent and chemical resistance. 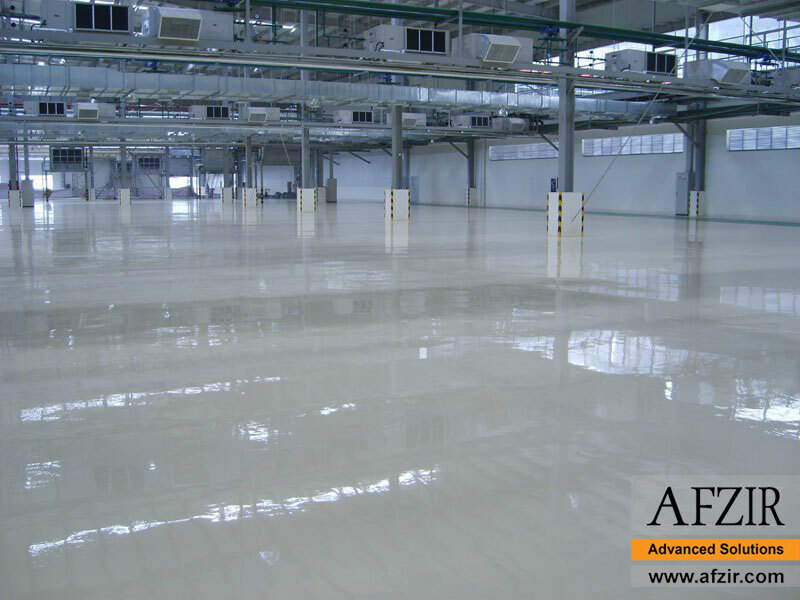 The different resins in these linings have broad resistance ranges, with acid resistance being a major strength. Some of the specific resins resist 1 or more chemicals or types of chemicals better than other resins, so systems often are fine tuned by the choice of resin for a particular chemical environment. 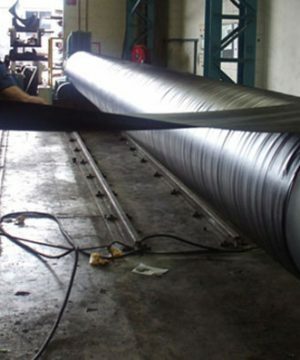 These linings include several systems varying in thickness, type of fillers and reinforcement, and application method. For each lining system, various polyester and vinyl ester resin bases are used to achieve the desired chemical resistance. 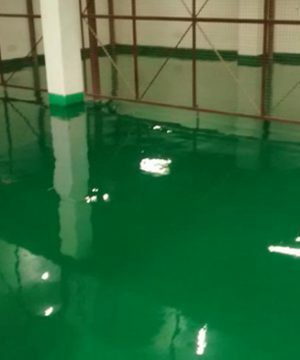 These resins generally are low in viscosity and cure quickly at ambient temperatures without post curing. They offer excellent adhesion and high strength. Polyesters and vinyl esters are known for their chemical resistance, although most are better in acidic environments than in strong alkaline conditions. (Alkaline solutions attack the ester linkage, reforming the polyol and a salt of the carboxylic acid.) They are resistant to organics, including solvents, as well. Polyesters and vinyl esters are used in applications that require resistance to aggressive chemicals and elevated temperatures as high as 212 F (100 C) wet or 350 F (177 C) dry. 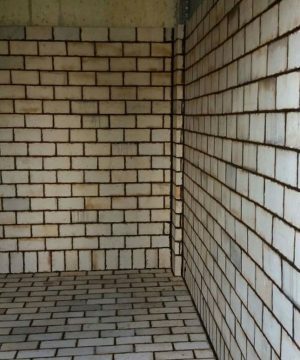 Uses include tank linings; floor linings; secondary containment linings; and coatings for structural steel, walls, and ceilings. Vinyl ester lining systems are used for top to bottom protection of industrial plants and equipment, especially where acid or organic chemicals are present. 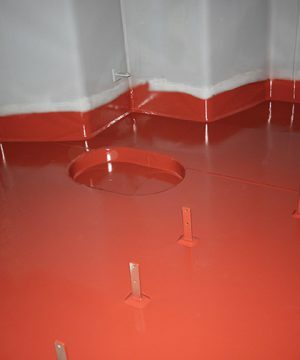 These uses include protective, spray-applied coatings for ceilings, walls, hoods, ducts, and tank exteriors; interior tank linings; reinforced flooring for process spillage areas; and trenches, sumps, and secondary containment surfaces. There are many applications for these products throughout the chemical process industry and in a variety of other industries that handle corrosive chemicals. Examples are given below. 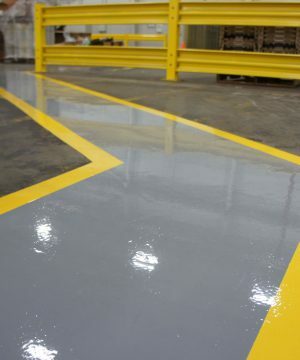 In primary metals plants, these products may serve as reinforced linings to protect concrete floors, foundations, and trenches from acids used for pickling. The pharmaceutical industry uses reinforced vinyl ester for sanitary protection of process floors exposed to acid and organic solvent spills. Special crack-bridging versions are used for truck unloading areas and secondary containment basins. 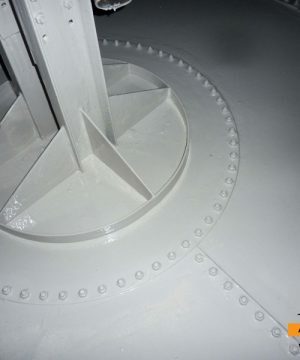 For more than 25 years, the power industry has used flake-reinforced and fiberglass-reinforced linings for scrubbers, tanks, ducts, and stacks to protect critical flue gas desulfurization (FGD) equipment for longterm service. The waste treatment industry continues to use these systems for storage and neutralization tanks, unloading areas, and secondary containment basins. 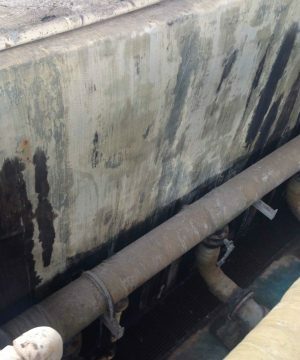 Chlorine producers use flake-reinforced linings for elevated temperature brine storage tanks. Municipal sanitation facilities use fiberglass- and flake-reinforced linings and coatings for grit chambers, sumps, and wet wells. 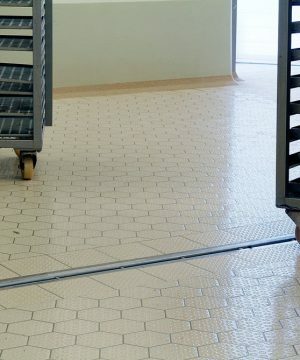 Glass flake-reinforced polyester linings are used in food-related applications such as starch tanks. Temperature of the surface and the adjacent air typically should be between 45 and 120 F (7 and 49 C) during product application to provide proper cure. 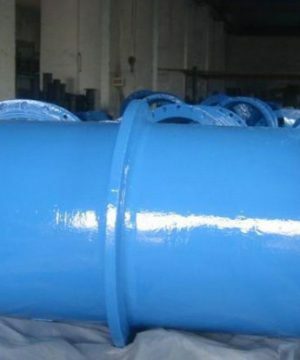 Excessive temperature can cause bubbling, pinholing, or high thermal stress in the finished lining. Consult the manufacturer’s literature for the exact temperature range. The surface temperature should be at least 5 F (3 C) above the dew point of the air in the work area to avoid condensation or application on a wet surface. Because of the generally high thickness of these systems and their use at elevated temperatures, proper surface preparation is essential to product performance. 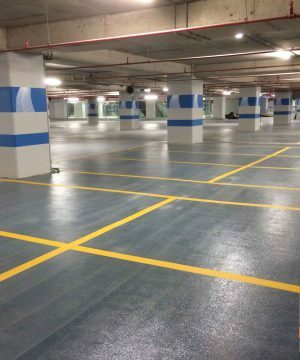 Concrete surfaces should be abrasive blasted and have sufficient tensile strength for the system being applied. Minimum acceptable tensile strength is about 200 to 300 psi (1.4 to 2.1 MPa), which is the maximum tensile strength achieved by portland cement concrete. Surface tensile strength can be determined in accordance with ASTM D 4541, Standard Test Method for Pull-off Strength of Coatings Using Portable Adhesion Testers. Steel should be blasted with a coarse, angular abrasive to produce a minimum profile of 3 mils (75 micrometers). Shot blasting produces a peened surface, so grit blasting is required. Stainless steel and alloys may require harder or larger blast media or higher blast pressures to achieve the desired profile. Surface cleanliness in accordance with SSPC-SP 5, White Metal Blast Cleaning, is almost always required. 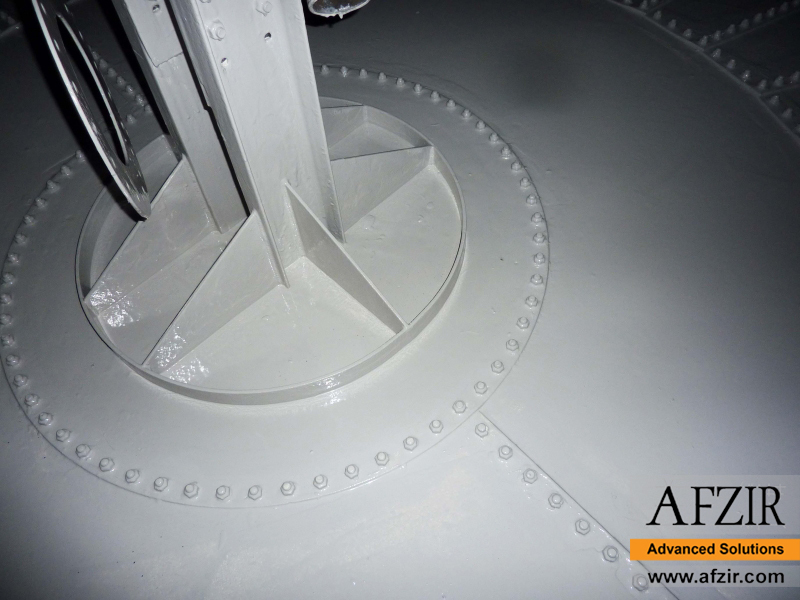 Afzir Company offers you a wide range of Vinylester Coatings for many applications.